I now have an account on Steemit, where I will be publishing short fiction from now on. My first story, Demon Slayer, is already up. It's a tale about a man and his wolf companion who have to save a small town inn from a hellhound. I hope you enjoy it. A short story that I wrote a few months back is going to be published in an upcoming anthology. It's the first book from a new small press publisher called Extant, run by the talented Kevyn Winkless. 21st Century Thrilling Adventure is a collection of stories that aim for the passion and drive of Radium Age action and adventure, but drag that energy into the modern age. For all they are maligned, the pulps of the 1920s and 1930s had life – they were exploding into an entirely new market and driving forward into brand new ideas. This collection features stories inspired by the action-adventure tales of the pulps, stories that range from hard boiled action, through tales of the weird to straight up fantasies of the modern world. The thing they all have in common is: energy. These stories hit the ground running! The book should be out sometime next month. I'm really glad to be part of this collection along with such skilled writers. So Brian Niemeier wrote a blog post last week on being more productive. In it, he cited Scott Adams’ maxim "Goals are for losers. Systems are for winners." So this week, with my short respite from Twitter, I decided to follow his advice. The text editor software I use for writing is a program called Focus Writer, which has a number of features to help one concentrate on typing words onto a blank document. One of these features is a Daily Goal keeper that I had been trying to meet for several months now and failing to do so most days, if I even got writing done at all. So I turned that feature off and stopped focusing on the number of words I wrote every day, as per Brian’s suggestion. I know I said on Twitter that I was going full hermit for three days to finish an editing project, though on day two inspiration for another QuQu video script struck, and I just had to write it down before I forgot. By this point, I realized that my editing project was going to take longer than three days, so put that on hold to finish work on the script. And in those last two days, I was able to crank out a script that was almost five thousand words long. For contrast, the last script I wrote before then took much longer, even though it was only around three thousand words for the initial draft. One of the things that Scott Adams talked about on his Whenhub blog is about scheduling your energy, not your time. In it, he talks about how people have different types of energy throughout the day, and how it’s best to schedule one’s activities around when their different states of energy are their peak. So I focused on getting my writing done early on the morning, not long after I first wake up. I think that one thing that helped the most with this is logging out of Twitter during the time when I'm supposed to be working. This meant that visiting the site would require taking multiple steps, which kept it from being as much of a distraction. Now that I’m back, I will likely hold off from posting on the site until late in the evening, after I run out of creative energy and my social energy kicks in. So I really do have to thank Brian Niemeier and Scott Adams as well for their advice. Go follow both of them on social media, and maybe buy some of their books if you’ve got the money to spare. Oh, and I also have to thank Templar Gamer for convincing me that I really needed a break from human interaction over the internet. A friend of mine asked me about some of the authors on the Appendix N list, so I have complied a list of all of the stories they wrote which are in the public domain. Edit: Nathan Housley pointed out that I had missed Manly Wade Wellman, so I have added him to the list. My partner in crime, QuQu, wanted a site where he could post his thoughts and opinions right away, rather than after an hour recording audio and several hours more editing video. So, QuQu Media was born. But you're probably wondering what this means for my personal blog, the AltFurry Den. My plan is to use this blog for updates on my fiction writing, while QuQu Media will be home for my editorial writing. I also plan on posting some short fiction pieces on the site once those are ready. I actually do have a twelve thousand word novelette that I wrote a few months back, which I hope to finish editing sometime next month. As for the novel I've been writing, I've gotten about two thirds of the way through the first draft as of this time. Though this was before I took a break to work on the next QuQu video. If all goes well, we hope to record this weekend, and if by some miracle I manage to edit the video in one day, it'll be out on Monday morning. Then I'll return to writing the book, which I hope to finish drafting by the end of the year. Today Bethesda announced that they are not going to send out review copies of their games until the day before launch. This means that the gaming press will not have much time to play through the game before it comes out. Many in the gaming community are upset by this, but I think that it’s a step in the right direction. I’d like to think that this will do at least a little bit of good toward ending the hype train. The hype train starts with game publishers releasing teasers and pre-release footage, then the media covers said footage on their blogs and YouTube channels, adding to the hype with every article and video. Consumers should be waiting until some time after launch before purchasing their games, instead of rushing to be the first on their block to own the game. In this day and age, AAA game releases are bug filled messes on the day of launch, with Bethesda being one of the worst offenders. Anything written in before the game is released, or even just after, is going to be useless to anyone looking to buy the game later down the line. An in-depth look at the game won’t be possible until the game has been out long enough to get several bug fix patches. There are plenty of overlooked titles out already that one could check out in the meantime, but then that wouldn’t get nearly as much traffic as articles on the latest AAA releases. Bloggers and YouTubers are incentivized to keep perpetuating the hype train, as their ability to make money depends on its continuation. If the hype train were to end, then a strong force for driving traffic would be lost. The business model internet blogging is fundamentally broken; it needs to be replaced with a new one that rewards quality rather than typing speed and emotional manipulation. I sometimes hear people talk about how the online movement known as GamerGate has long since run its course, but these claims always confuse me. While I’ve been focusing more on my own projects as of late, I still hear about GamerGate happenings on occasion through the grapevine, and the group would seem to still be fairly active. The latest thing I heard from them was that the creator of a type of VR headsets was getting a several hit pieces written on him because he was dating a Vivian James cosplayer. So while GamerGate is far from the chaotic fun house that it was in August of 2014, it’s still alive and kicking. KotakuInAction posts still get hundreds, sometimes thousands of upvoats, and posting to Twitter about GamerGate is still a great way of acquiring a large base of followers who RT much of what one says. So long as Twitter users continue to include the #GamerGate hashtag in their tweets, then GamerGate will continue to live on. I would even go as far as to say that GamerGate will never die, that it will live on as long as Twitter and Reddit continue to exist. And there is a very specific reason why the group will continue on forever, which I will get to a little later. But first I must explain how we came to the current situation in regards to GamerGate. The first step was to brand anyone who dared discuss the GamerGate controversy in anything beyond mockery as a GamerGator; these ‘Gators’ were then banned from most popular video game discussion platforms. It wasn’t just those who wished to destroy all the gaming blogs and blacklist the SJWs from the industry who were forbidden from posting; even the most vanilla of moderate voices was also cast out. Just look at when Boogie2988 got banned from NeoGaf, when all he really wanted was for everyone to get along with each other again. The second step was to outgroup those who actually wanted to start a revolution, those who wanted all the corrupt gaming sites out of business, those who wanted an industry-wide practice of refusing to hire SJWs. This was done by tightening the rules for discussion communities on Reddit and 8chan, branding all discussion communities that didn’t follow suit as Not GG™, and making lists of supposed Bad Actors who are to be shunned as Turncoats. This left the True GamerGate Movement™ with only those moderate and neutral observers who had the GG label unwillingly thrust upon them and people who were just in it for the fake internet points. The third and final step is to force the GamerGate label on any dissenters within the larger gaming community, like when Beamdog blamed GG for “launching a negative review campaign” against Siege of Dragonspear. That way, a gaming company can censor any harsh criticism of their product simply by branding their angry customers as “GamerGate Harassers.” This has the effect of discouraging users from criticising their false narratives, or else they will be forever branded as GamerGators, with all the negative baggage that comes with that label. 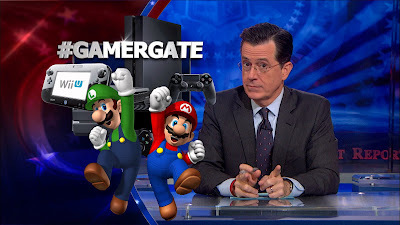 The narrative among SJWs is that GamerGate is a harassment group, a new name for one that has always existed since the dawn of gaming, the last dying screeches from the “Traditional Gamer.” There is no way of convincing SJWs otherwise, short of GamerGate discussion platforms censoring all criticism directed at anyone who is not a straight white male, no matter how minor. The only option is to continue mocking and ridiculing SJWs until everyone else can no longer take their rhetoric seriously. Next month, when Watch_Dogs 2 comes out, I’m predicting that criticism against the game will be labeled as GamerGate racism. Anyone who does not like the game will have the GamerGate label thrust upon them and thrown out of their discussion communities. This will be used not only to censor criticism of their game, but also to drive sales of the game from people who follow SJWs. So you can see why GamerGate will go on forever and ever, like an autistic phoenix that’s reborn every other week. The label is too useful as a deterrent from certain behaviors that video game publishers do not want their customers engaging in. And so long as Twitter lives on, GamerGate will continue to be the whip the gaming industry uses to keep Gamers in line.